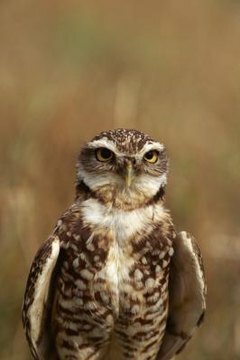 Burrowing owls (Athene cunicularia) are white and brown birds that are abundant all throughout their geographic base, which encompasses areas all over the New World, from Venezuela, Suriname and the Dominican Republic to the United States and Canada. Unlike the majority of owls, members of this species are active during the daytime. These wee owls grow to around 10 inches long, with weights of roughly 6 ounces. No size differences exist between the genders, which is not the case with many other owl species. Their common names come from their burrowing lifestyles. Burrowing owls typically set up residence within holes that were previously carved out by tiny creatures such as skunks, prairie dogs and gopher tortoises. Their favored living environments include deserts, steppes, airy grasslands, prairies, farming sites and pastures. They regularly consume food such as mice, snails, frogs, moles, lizards, beetles, crickets, grasshoppers and fellow birds. Burrowing owls typically live for 6 to 8 years. The migration styles of burrowing owls are rather mysterious, whether it comes to the exact paths they take or their traveling habits. The bulk of burrowing owls that reproduce throughout the northern portions of their range are believed to head south in the autumn during the months of September and October, indicates the U.S. Forest Service. This applies to owls in northerly locations like Canada and the Midwest. When they arrive south, they remain put until spring. Once March and April roll around, burrowing owls promptly travel back north. California is a common spot for wintering burrow owls, as are Texas, Arizona, Louisiana, New Mexico and Florida. Outside of the United States, they also frequently fly to Mexico, Central America and South America for the winter. Burrowing owls are not migratory birds in all cases. They live in certain parts of Florida -- such as its southern and central regions -- for the entire duration of the year. This also sometimes applies to southern California, the southwestern states, certain South American regions and Mexico. The specific breeding grounds of burrowing owls might have an effect on where they choose to spend their winter months. Burrowing owls that breed in northern locales -- think Canada -- are believed to travel to areas deeper south than those that breed in the States.